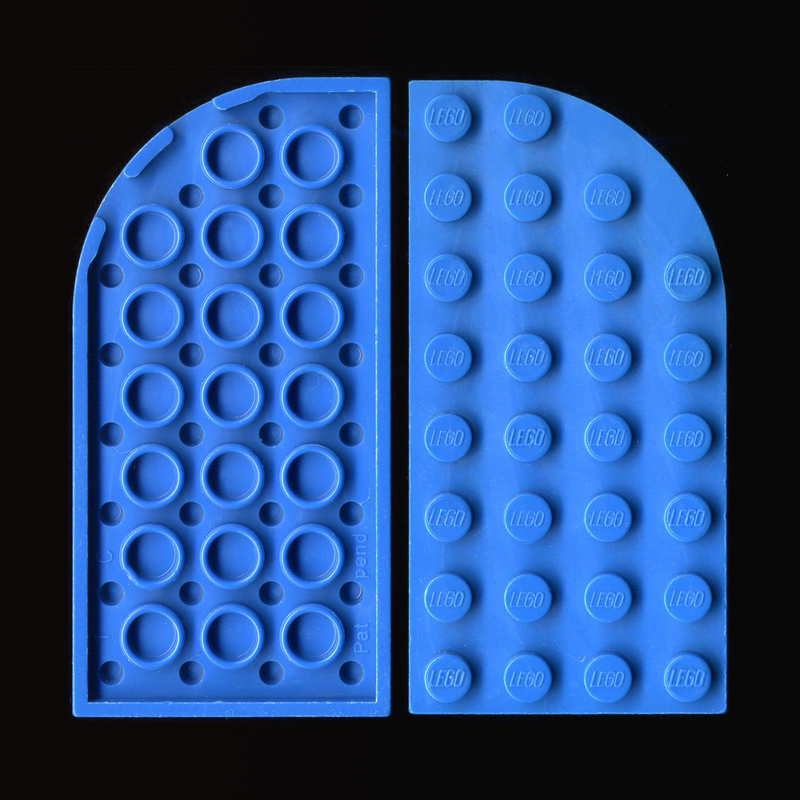 Another notchless part from that time is the 4X8 plate with a curved end (parts 712 and 713); designed that way perhaps because they were only ever used in sets as overhanging rooves, so there was no great need to change the mould. Or was there? British LEGO Ltd. (the company licensed to produce LEGO for the UK, Ireland and Australia until the early 1990s) did in fact make notched versions from their factory in Wrexham, northern Wales, starting in 1965 and ending when the part went out of production just two years later. As with so much of TLG's history, the circumstances are unrecorded so we'll probably never know who instigated the redesign and why it didn't happen in Europe. These notched versions are very rare nowadays but the ones pictured here are even rarer; Blue [BL]/Bright Blue [TLG] prototypes never released in a set! My thanks to Gary Istok for supplying this picture and for these great bits of historical trivia from his LEGO history book. As wing pieces began appearing in LEGO, such as in aeroplane and Classic Space sets, they too were notchless. My guess is, like the 4X8 curved plates, that this was because their primary intended usage did not require the diagonal edges to be attached to parts below - they were, by definition, wings. Although in the very first year the 4X9 aeroplane wing appeared, 1987, it was also used as the base of a fire crane! In that same year part 2419 appeared, the 3X6 wedge plate with two 45° cut corners. Significantly, it did have notches so was clearly intended for wider usage. This apparent distinction I'm drawing between 'notchless wings' and 'notched wedges' seemed to continue throughout the 1990s and early 2000s. But in 2003 the 3X4 notchless wing with 1X2 cutout (part 4859, first introduced in 1985) was redesigned with notches. And now in 2013, the decision has been made to give the 4X9 aeroplane wing notches too, so for those who still like to use it as a wing, the presence of notches is a distinctly unwelcome aesthetic. I'm happy though. I never use it as a wing, so now there's another diagonal tool in the box at a wonderfully shallow angle. Apparently the redesign was discussed at quite some length by Design Lab (the TLG department responsible for designing new elements and acting as “custodians” of the System) and I can imagine why. It's a strange part, for a number of reasons. Firstly, those rounded corners on the wedge end. Given the part was being standardised to a degree, I'd have thought those corners would have been sharpened. TLG have had to round off corners on various parts to meet recent child safety laws but that surely wouldn't apply here - if so, all plates would need to be rounded - but maybe adding sharp corners to something intended to be used as a sticky-outy swooshy aeroplane wing was deemed a bad idea. Or perhaps the rounded corners were retained simply to respect the history of the part. Secondly, it's nine studs wide. Wing parts often seem to have odd dimensions (literally), but a nine-wide plate is unique (or so I am told, and can't be bothered to research). I like this and am glad it wasn't altered to be eight or ten studs like common plates. Now that it has notches it could simply be used like a regular plate in a build, so long as you're covering up the diagonals. Whilst you don't often need a nine-wide plate and could almost certainly find a workaround, I just like knowing that the option is there! There have been many crazy angles in wing parts over the years but as I mentioned, in contrast, the notched wedge families are wonderfully systematic - let's remind ourselves of these. This was generated in LDraw so there isn't a notched aeroplane wing to use yet. As well as notchless plates I've omitted octagons and compound angled plates, for clarity. Brian D'Agostine (DagsBricks) has compiled a thorough listing of angled plates, both notched and notchless, on his excellent blog. You'll also find a similar one for sloped bricks, and he cross-references angles between the two which is very handy for SNOT work. A purely systematic approach to redesigning the aeroplane wing would have been to change the angles to 6:1 ratio; thus losing the half-stud corner whilst retaining the overall 4X9 dimensions. But that would have been a huge aesthetic alteration. Keeping the angle shallow but losing the half-stud (12:1 or say 10:1 as a compromise) would have required a much wider and deeper plate. Who knows; maybe the aeroplane wing will be the first of a family of half-stud wedge plates. OK, I doubt that would ever happen, but a 1.25:1 would be very useful. But it might be more realistic to hope for a 2X2 wedge to join the 1:1 family. And a 2X6 for the 6:1 family. Pretty please, Design Lab! The other possible future event is that other wing parts will get notches, but I'm not sure that any get used enough to warrant a redesign. I also welcome this piece, though it is a rather peculiar part in either variation! Beyond just adding the notches, I appreciate that the designers also added additional tubes to provide even more building options: now, with some 1x2 jumpers attached lengthwise with the studs inside the outer row of tubes, you can have a 3-stud-wide surface attached securely underneath this four-stud-wide wing (I hope I described that sufficiently for you to understand what I was saying!). Incidentally, 48183 is NOT the "current version" of the 4x3 double wedge plate with 1x2 cutout. The actual "current version" is 90194 (http://brickset.com/parts/search/?query=90194). 90194 keeps the notches from 48183 but has some additional bracing on the underside. The part you have pictured in your comparison photo actually IS a 90194, not its cousin 48183! Incidentally, are there any wing/wedge plates still in use that DON'T have notches? I think 2413 might have been the last holdout, considering that most other notchless wing plates have been discontinued for many years. Haha... the irony is, there I was zoomed in on the element ID embossed on the part when I was cleaning the dust off the pic in Photoshop, and didn't notice! Didn't see the wood for the trees. Thanks! It's a very odd part, but the notches will be cool if I ever get it and use it. I've got a good question, though. 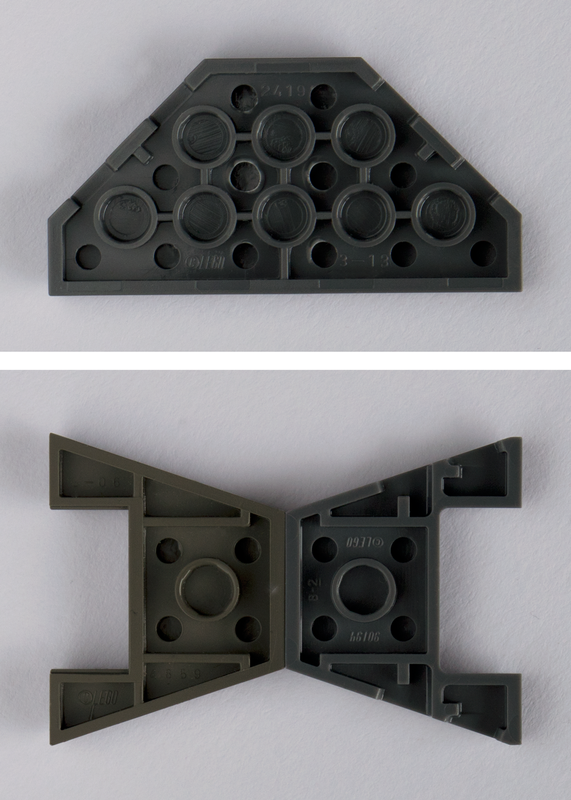 Why is it that the 3:1 wedge plates and bricks have two notches, but the really big wing only has one notch for every two studs? It's just a matter of how many notches they need to accommodate the studs underneath. Whichever parts of the plate would collide with studs on a studded surface get notches, and those where the plate walls can simply be narrowed or left alone do not. No, why does this part: http://www.bricklink.com/catalogItemPic.asp?P=30355 which is the same angle as this part: http://www.bricklink.com/catalogItemPic.asp?P=43723 not have two notches for the two studs it goes over where those notches are? Why is there only one? You know, I honestly never even noticed those long notches? I have no idea. I'm sure there are dozens of considerations the part designers take into account. It doesn't feel like it could be an aesthetic choice...? Anyone know? I have no answer (and hope somebody else does), but I just want to say that this discussion is an example of the kind of things I love about this blog. I may have found an answer, but I have no proof. If you look at an old Airplane wing, Part 3585 and/or 3586, there is a giant section in the back that is esentially one notch. 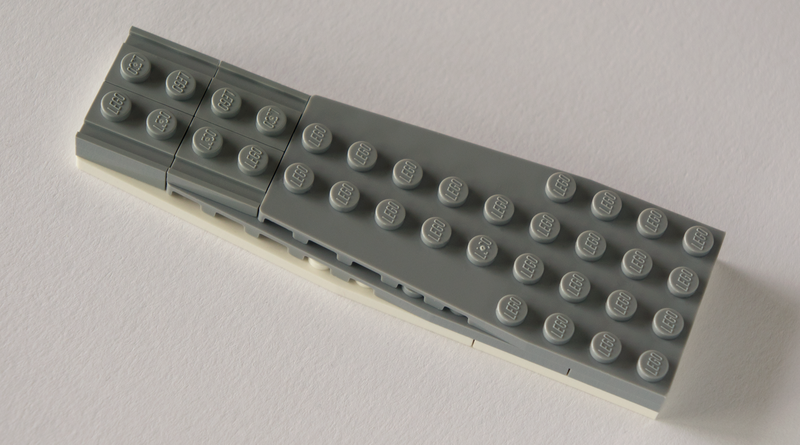 The 30355 and 30356 would have been some of the first parts that were not 1:1 wedges to incorporate notches and would have been used in old space sets as wings. Perhaps it is one of those things that back when a part was first made; if it had a wedge design, there would either be no notches or there would be notches that had to go over each stud, but instead of going over each one with an individual break in the notch, they went as far as it took before there would be the ability to add a new row of studs. The part design, despite being old, has not proven to hinder anything, so the designers have just left it alone. Just as much as parts evolve over time, design changes do too. One part gets a new modification, and they probably pay special attention to complaints that they receive that are related to it. In this case, the large wings clearly have obtrusive notches when stacked together. Those notches probably also introduce massive stress points that cause them to crack at the corners of the notches. Newer notched wedge plates often have ribs that tie into the back of the anti-notch, which helps strengthen the notched edge and help prevent breakage. I don't have any solid proof that this is the answer to your questio, but if you pay attention to the way a family of design changes evolve as they are introduced to a group of elements, you can take an educated guess as to why they switched from mod A to mod B to mod C and beyond over time. Sometimes it could be completely unrelated to previous parts, and just thrown in because the current part is just different enough to require special treatment, but usually you'll be able to see a pattern that either stays consistent or keeps moving in a clear direction. You appear to be missing a few of the compound wedge plates, parts 3585/3586, 6219, and 42609. These are the numbers as searchable on Bricklink. I had compiled a list of these with their angles a while ago at http://dagsbricks.blogspot.com/2013/05/lego-tips-and-techniques-slopes-part-2.html. It looks like due to BL's cataloging choices I had missed the boat plate though. I like how you have them listed as ratios, that might be a little easier to comprehend. To be honest, I think angles are easier to comprehend than ratios, but using ratios fitted the point I was making about whole integers. Great article as usual. I would have really appreciated links to the Brickset or Bricklink entries for the part references not pictured, especially the older, less well-known parts. I'm well-versed enough in LEGO to follow pretty much all of your comments, but as a very visual person I like to see photos of what's being discussed. When talking about so many similar pieces, it's easy to get lost. Also, in the 6th paragraph, I believe you meant "notched" not "notchless." Yes fair point Chris. The macaroni pic got jettisoned for reasons of layout, but you've reminded me I did intend to add a table listing the plates in the LDraw image. Will take a look tomorrow. And yes you're right about the 6th para... my brain clearly gets fried the longer I spend writing! I have used 14181 in 2 MOCs, and I've had problems with it. I believe the old version doesn't suffer from this, because its underside support makes it sturdier. Basically, take one 14181, and place a 2x4 tile at the end of it. It will bend upwards, in a bad way. Take a look at this MOC: https://flic.kr/p/KJTvxF. The whole cockpit lifts up, so the wing part isn't attached underneath. And there is a reason I used 1x2 tiles to cover it - as I wrote, longer tiles would bend the part upwards and it was exposing a big gap.